I bought this book after Kelly and Alexa raved about it, but I kept putting off reading it. I don't know why it didn't appeal to me that much - maybe it's the combination of the cover and the focus on elementals. I trusted both ladies enough to buy it, but I didn't prioritize reading it. And then I found myself in a bit of a reading slump, and this seemed like it was worth a shot. Now that I've finished I want to know WHY ISN'T EVERYONE TALKING ABOUT THIS BOOK? The Burning Sky totally caught me by surprise. It begins with an elixir and a bolt of lightning - that's all it takes for Iolanthe Seabourne to learn she's the greatest elemental mage of her generation. The prophecy says she'll be the savior of The Realm, but she's unsure of her own ability and unprepared for the tasks to come. Prince Titus, guided by his mother's visions, has sworn to protect and train Iolanthe to face off against the Bane. I should have known Kelly and Alexa wouldn't lead me astray, but I was unprepared for just how much I was going to love this book. I loved the opening - it immediately made me curious about what was inside. But would it live up to the promising start? The first 50 pages or so were a little confusing, I'll admit. From the world to the terminology, it was a lot to wrap my mind around. And Thomas has done something really clever by including a "Notes" section at the end with excerpts from (fictional) texts related to this world. It's insanely creative, but it's also a little overwhelming right at first. Once I'd read a few chapters, however, I found my stride. I was devouring The Burning Sky! Because here's what I didn't know before I started this book: it combines my two favorite genres, historical fiction and fantasy. The book opens in the fantasy world, but it soon shifts to the historical setting. And at that point, I knew it was going to become a new favorite. I'm obsessed with the way Thomas has combined the two worlds, and I have to applaud her imagination for the way she was able to do it. When I finished the book, there were still some things about the setting that I felt needed a little more development of explanation... but since I've already read The Perilous Sea, I'll go ahead and tell you that Thomas totally delivers in the next installment of this series. So, that's the setting. But what about the plot, characters, and writing? I can't say enough great things about each of these aspects! I loved Thomas's writing - it's clever, smart and so engaging. The plot is fast-paced and creative with just enough conflict and complications to keep me hooked. I wanted to know more about the prophecy regarding Iolanthe. I was dying to know how they'd challenge the Bane, what he was doing to stay in power and what it would take to save The Realm. I was grinning as Iolanthe and Titus protected themselves in the historical world, and I was so pleased with the way they were hidden in plain sight. Speaking of the characters, Iolanthe and Titus are new favorites for me. Individually and together, they're two of the best protagonists I've read about this year (if not in the last few years). I loved their bickering, their banter, and their butting heads. It's everything I adore in a relationship! Iolanthe is amazing. I loved that she's unaware of her own talent, that she speaks her mind, that she's able to disguise herself as a boy (this was one of my favorite parts of the book!) and that she doesn't just do what Titus tells her. And Titus is equally wonderful! He's smart, dedicated to the cause, single-minded in his commitment to protect Iolanthe and fulfill his mother's visions. I could't have imagined two people better equipped to bring down the villain! 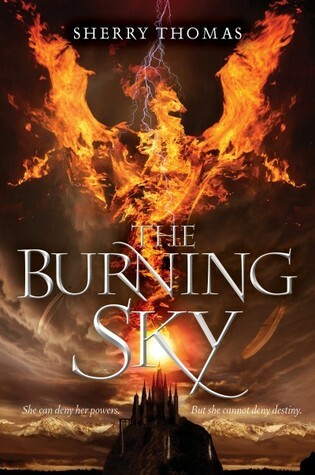 Seriously, y'all, I can't say enough great things about The Burning Sky. I had no idea that it would win me over with all of my favorite things, and I still can't figure out why I don't hear more people talking about this series. Or maybe I've just somehow missed it? Either way, make sure you've read this book! It's epic, and you can - as the opening will tell you - expect magic. "This is the story of a girl who fooled a thousand boys, a boy who fooled an entire country, a partnership that would change the fate of the realms, and a power to challenge the greatest tyrant the world had ever known. Expect magic." Does the cover remind you of Moltres? hahaha I can't stop giggling.